Unwarning: Despite this being the second book in the Craft Sequence, there are no characters from the first book in this one, or plot spoilers, so you’re perfectly fine reading the review–and the book–if you’ve not read the first one yet. 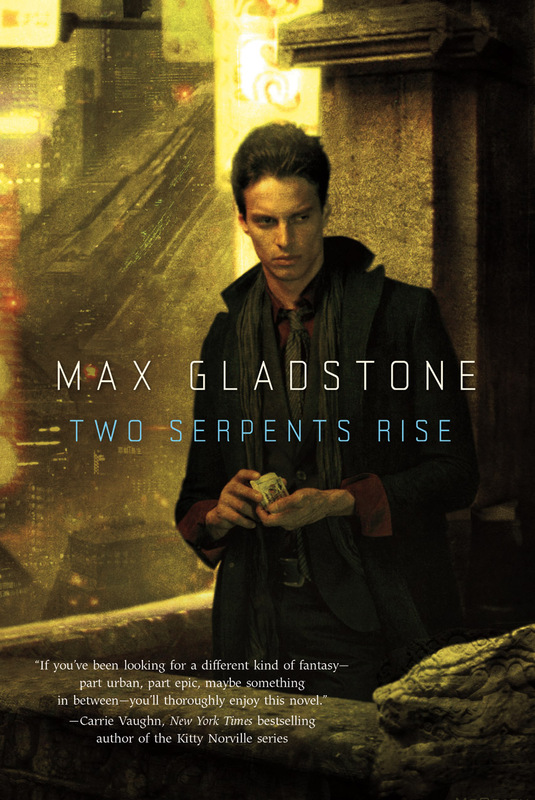 In Two Serpents Rise by Max Gladstone, shadow demons plague the city reservoir, and Red King Consolidated has sent in Caleb Altemoc–casual gambler and professional risk manager–to cleanse the water for the sixteen million people of Dresediel Lex. At the scene of the crime, Caleb finds an alluring and clever cliff runner, Crazy Mal, who easily outpaces him. But Caleb has more than the demon infestation, Mal, or job security to worry about when he discovers that his father–the last priest of the old gods and leader of the True Quechal terrorists–has broken into his home and is wanted in connection to the attacks on the water supply. Two Serpents Rise overcame many of the issues I had with Three Parts Dead, the first book in the Craft Sequence, with only a single change: Instead of trying to fully use half a dozen viewpoint characters, Two Serpents Rise limits itself to one, with a few other characters getting supporting viewpoints near the end of the novel. I felt that this really streamlined the reading experience, because it gave us a lot less character overhead we had to get to know. It also lowered the immersion time at the beginning of the novel—no skipping around just as you’re starting to get accustomed to the person whose head you are inside. I really liked the change, especially for the length of book that Gladstone writes. But that doesn’t mean that the other characters are simple shoved to the side and undeveloped. The cast here, while perhaps not quite as brilliantly varied as the first novel, still rises to a level above that of most other books. Our main characters this time include a gambling addicted yet risk averse man, his father, who is the last of an ancient sect of sacrificial priests, his best work friend and her slightly crazy artist girlfriend, his undead skeleton boss, and his crush, who happens to have some very interesting secrets up her sleeve that I don’t want to spoil for you. And they’re all vividly developed and quite well done. Gladstone had to do a lot of heavy lifting here, as this novel has no characters in common with the first one, and so he has to introduce us to his all-new cast and get us familiar with them, something he does with grace and precision. The uses and ways of the craft are different here as well, and the magic and the world of gods and demons, dragonfly transports and flying houses, might as well be a character in and of itself, one which shares little with the first book, but just enough that we have a grounding in the magic and not quite as much reintroduction is needed. Gladstone continues to take the approach of knowing what all of the rules of his system are, but not revealing them all to us, giving it an interesting feel that I’m still not entirely comfortable with, but can definitely accept and know is pretty darn cool. Thanks largely to the single main viewpoint character, the plot of the novel is even more interesting than that of the first book, and I found myself devouring the pages during lunch breaks to try to read more of this amazing book. The stakes are suitably high, and by the end, I was on the edge of my seat. The climax was satisfying, as long as I accept that there will always be another aspect of this magic system that I don’t fully understand, though I was also a little disappointed that we didn’t have as many twists and character based surprises as the first one, but again, that is a minor complaint. In summary, Two Serpents Rise is a worthy successor—but not direct sequel—to Three Parts Dead, and I thoroughly enjoyed reading it thanks in large part, I think, to its restricted focus on a single viewpoint character which streamlined the plot and made it considerably easier to understand in 350 pages, and Gladstone somehow managed to do this without sacrificing the coolness, diversity, and depth of his cast. While the conclusion is not quite as twisty and exciting as the first novel, it’s still very satisfying and wraps up the threads started in this one, leaving me excited and wondering where Gladstone is going to go with the third novel. A solid Four of Five stars, and I’m looking forward to starting Full Fathom Five on my lunch break today.